Did you know that homeowners spend between $12,000-$34,000 on their kitchen remodel projects? If you’re currently interested in transforming your kitchen, you have a lot on your plate (pun intended?). Not only do you have to budget for your dream kitchen, but you have to work with contractors to make sure that dream is transformed into reality. What’s more, you’ll need to make dozens of decisions on style, design, decor, and more. One of those decisions will include your flooring. At Mountain Valley Floors, we’re proud to serve you and your flooring needs in Loveland. It’s our mission to make sure you get the best Loveland hardwood floors at affordable prices. 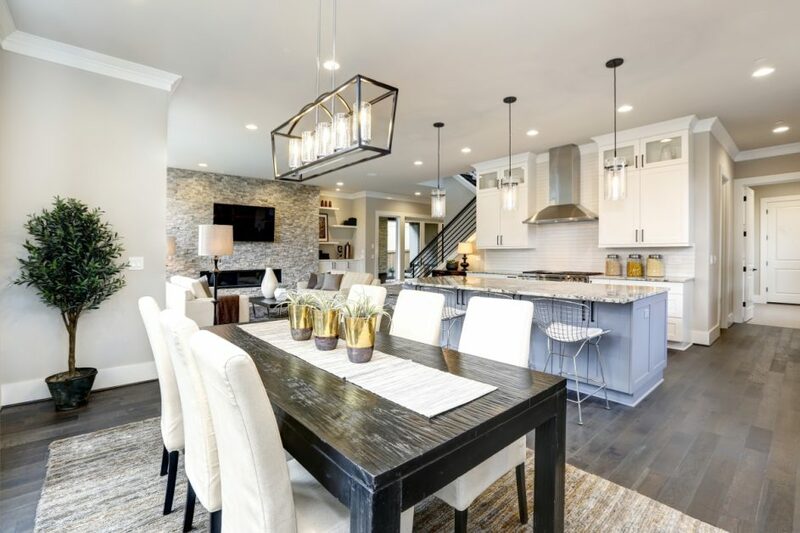 To help you move closer to a completed kitchen remodel project, we want to share in this article how you can choose kitchen flooring that you’ll love. Remember, this is your kitchen we’re talking about. No one else has a final say on which type of flooring you choose. You can get exactly what you want. With that being said, here are some high-level tips on how to choose flooring that you’ll love. You’re remodeling your kitchen. It’s time to let your dreams run wild. Don’t start with limiting beliefs that you cannot get the flooring that you want. What you ought to do is determine your decor style so that when it comes to choosing flooring, you have a target to aim at. Modern, contemporary, ranch, or classic are all viable options. This is your kitchen, so choose which type of flooring you want to install. While it’s common to visit the nearest flooring showroom to start dreaming about your new kitchen, it’s best to determine your budget before you go shopping. This helps narrow your flooring options down quite a bit. There are dozens of flooring types, styles, and colors to choose from, so you may feel overwhelmed at first. A set budget can help you manage the overwhelm and find the flooring that fits your vision. How will you use your floor? Granted, most people walk, crawl, or lie on it, but your lifestyle ought to play a role in deciding which type of flooring you should purchase. Do you have children? Do you have pets? Are you empty nesters? No matter your lifestyle, you can find a type of flooring that fits your needs. #4. Understand Cleaning and Maintenance. It’s inevitable that your floor will catch a few spills, crumbs, or dirt from your life. As mentioned above, you want to determine your lifestyle and use that to choose your flooring. Once you determine the function you need from your floors, you can then ask about cleaning and maintenance. While most flooring is easy to take care of, there are types of flooring that require more attention than others. While you’re shopping, ask about flooring maintenance and decide if you want to take care of your floors in that manner. Mountain Valley Floors is here to help you with your hardwood flooring needs. We serve Loveland and the rest of Colorado with top-tier, full-service flooring services. Call us today to get a free consultation. ©2017 Mountain Valley Flooring. All rights reserved.